As green as its corporate logo – or greener still: TD Bank Group, one of the six largest banks in North America and the first to fully offset its corporate carbon footprint, has placed the environment at the core of its business model. The Canadian-based bank has been carbon-neutral since 2010. A year later the bank opened its first net-zero branch, located in Fort Lauderdale, Florida. This facility produces as much energy as it uses and thus pushes the envelope of the LEED (Leadership in Energy and Environmental Design) rating system maintained by the U.S. Green Building Council. At the time, the bank’s Fort Lauderdale branch was one of only nine net-zero buildings in the entire country. “Early on, TD recognised growing environmental awareness as a mega-trend and not just a factor for risk assessment, much less a passing fad. Green is set to guide future corporate policy and reshape the business world. Rather than wait for this trend to overtake us, TD decided to become a driver of events,” says Mike Pedersen, the president and CEO of TD Bank, the U.S. banking arm of TD Bank Group. A former chairman of the Canadian Bankers Association and a graduate of the University of British Columbia and the University of Toronto, Mr Pedersen earned his financial spurs in London, where he held senior positions at major international banks. 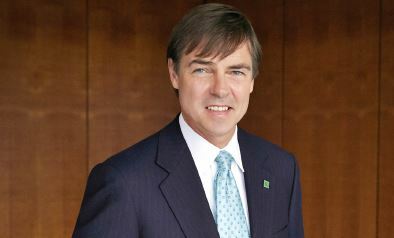 He returned to Canada in 2007, joining TD as Group Head, Corporate Operations, and in 2013 moved to the U.S. to take up the helm of TD’s U.S. bank, which now has more branches in the U.S. than in Canada. An avid outdoorsman, Mr Pedersen extensively walked and trekked the backwoods of British Columbia, where he spent his formative years. Born in Denmark, he arrived in B.C. aged 12 after his mother married a Canadian and moved the family. Largely as a result of spending his teen years amidst the natural splendour of Western Canada, Mr Pedersen has long been actively involved with conservancy efforts. TD’s commitment to the environment constitutes an ongoing process that is continually evaluated and adjusted to optimise efficiencies and synergies. By the end of this year, the bank aims to have reduced its paper use by 20% versus 2010. TD has been paper neutral since 2012 thanks to paper reduction initiatives and protecting critical forest habitats.